Is There More Vintage Dressing Today? “Are more people wearing vintage, or is it simply getting more press?” asks Brenna in “The Original Upcycling” on Worn Through. I’m a sociologist, which means my mind starts with data. It is difficult to say whether more people wear vintage clothing today, simply because we do not know how many people were wearing vintage clothing in the past – we have no baseline against which to compare. The tendency to purchase vintage is not a Census question or part of other large national polls like the General Social Survey that provide easy comparisons. Before going further, it’s useful to think about the difference between “vintage” and “secondhand” clothing. “Vintage,” a term applied to clothes only in the last few decades, is a subset of secondhand garments that are usually 20 years old or more. Secondhand clothing includes newer clothing and it is usually difficult to discern whether it was purchased used or as new ready-to-wear. Vintage clothing, by contrast, is usually acquired and worn precisely for its anachronistic look. That said, secondhand clothing purchases are up. In fact, they almost always rise when there is an economic recession. Secondhand clothing purchases rose in the 1930s and 40s (Great Depression followed by war), in the 1970s (during the oil crisis) and again in the 2000s with the world economic recession. In fact, my interest in researching secondhand clothes was piqued when I read a 2008 Observer article on how charity shops in Britain were presented with the problem of not enough supply of quality secondhand clothing to meet the demands their customers. Is vintage clothing following the same trend of rising sales? While it makes sense that when household budgets are stretched shoppers would seek secondhand shops, it doesn’t necessarily follow that they are looking for clothes from decades past. Vintage is often priced much higher than clothes at the local Savers or Goodwill. On the other hand, vintage dresses are often priced lower than a new designer garment of comparable quality. At this point, I don’t know for certain whether vintage retail sales are up. Yet, where I live, in the Twin Cities, there are more vintage stores today than in the 1980s. And bricks-and-mortar stores are not the only game in town now anymore. On-line retail sites like E-bay, Etsy and even Modcloth also sell vintage clothes. Also, the population of 15-25-year olds, the primary market for vintage clothing stores, is larger. Thus it is highly likely that, in absolute numbers, there are more people wearing vintage clothes today than in the past. What we don’t know is whether the proportion of people who wear vintage has changed. Brenna also raised a publicity question – is there more publicity given to wearing vintage clothing than in the past? I have been researching when wearing vintage clothes became a mainstream fashion trend (Tove Hermanson gives a great account the history of vintage as a countercultural trend). What I found was that mainstream magazines started discussing wearing old clothing in the 1970s. It was first referred to as “antique dressing” in 1978 by Seventeen magazine. In April 1979, the label “vintage” appeared in Vogue (though it is unlikely that Vogue first coined the term). While Vogue writer Anne Hollander mentioned the new “boom in vintage clothes,” her initial assessment of the trend was not very favorable. It took slightly longer for fashion magazines such as Vogue to give positive publicity to vintage dressing, in the early 1980s. But once vintage broke that barrier, I found that fashion magazines, newspapers and other publications (like Time or Newsweek) have annually had a constant flow of articles, photos and vintage guides ever since. Judging from the fashion press, dressing vintage has been “trendy” for 35 years. Why did dressing in clothes from decades past become popular when it did? And, more importantly, why has dressing vintage remained popular for so long? With the rise of fast fashion, is vintage a way to be a conscientious dresser since the clothing is not new, not made in sweat shops, and better made so it will last longer? Or is it overestimated? Is vintage a way to preserve workmanship, as “The Invisible Woman” called it? Do you think vintage inspires people, or do you think it goes unnoticed? Are more people wearing vintage, or is it simply getting more press? If more people are wearing vintage, what do you think are the reasons behind it? What are the benefits of wearing vintage? Do second-hand clothes still have a “stigma” of poverty or protest? Do any of you use vintage pieces to teach your students about fashion history, or are their certain construction techniques that are better illustrated by vintage clothing? Is the wearing of vintage actually a bad thing, because the wear of everyday use prevents preservation? Should vintage be given more credit for its preservation, and the good it does for the environment? Many people, when secondhand/vintage clothing hunting, look first (well, maybe second, after seeing an interesting print on the rack) at the label. There are labels that perhaps we are delighted to see, associating a particular designer’s name or clothing company with quality, comfort or as “our” style. 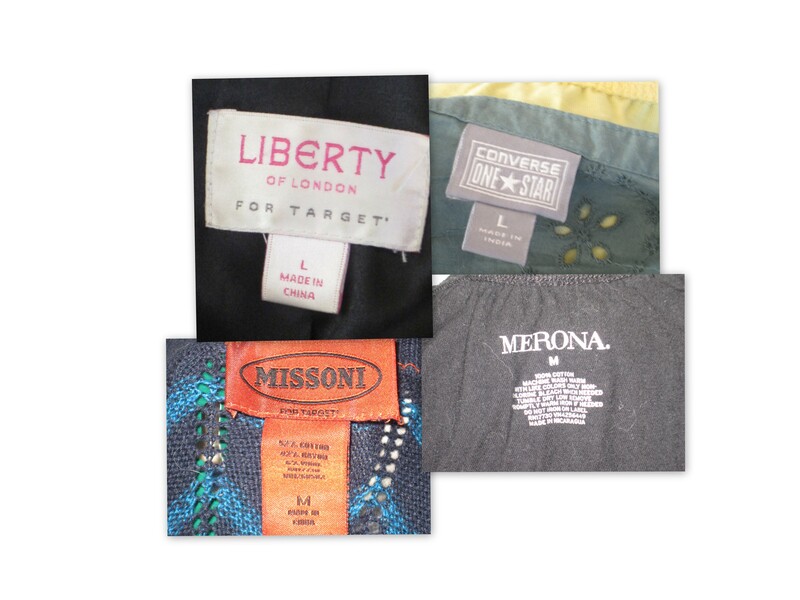 Labels often play a bigger role in determining the price of the garment than its actual condition. I’ve seen secondhand Chanel or Prada still command a hefty price, even with stains or the stitching coming undone. Why the fascination with labels? According to Dana Thomas in Deluxe: How Luxury Lost Its Luster the valuing of labels in fashion may have gotten its start in 1888 when Georges Vuitton (son of Louis) put the label “Marque Louis Vuitton deposee” (registered trademark Louis Vuitton) in one of its signature traveling trunks to mark it as authentic from those of copying competitors. A label of a trusted company meant authenticity and high quality. By the early 1950s, Parisian couture designers like Christian Dior and Pierre Cardin were licensing their names to hosiery producers, American department stores and clothing manufacturers so that the newly prosperous middle classes could afford a piece of luxury, albeit if mostly in name. The association of a designer label with social status remains today. Of course most labels in one’s closet may not have a luxury association. 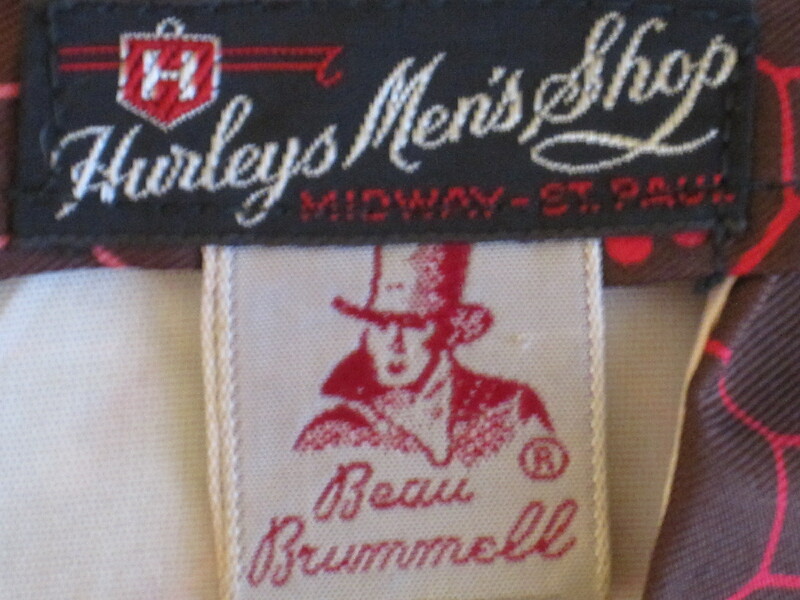 When I look through vintage clothing, what I love about the labels is the sheer diversity of the clothing companies, stylists and designers who, at one time, produced clothing. Some have quirky names, use funky fonts or quaint imagery. 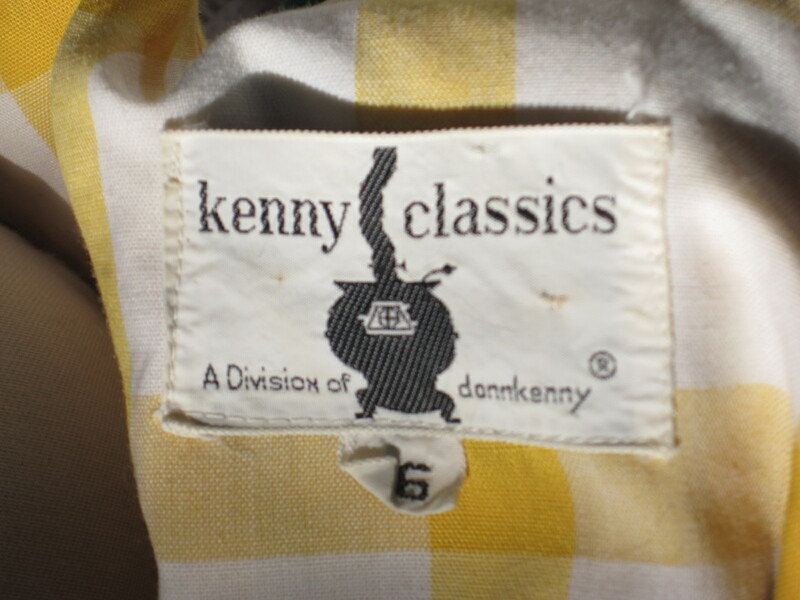 Whenever I look at this Kenny Classics label in my 1960s yellow gingham dress, I always wonder, “why did the company use a wood-burning stove on its label?” Perhaps they thought that yellow gingham went with home and hearth. The Vintage Fashion Guild website is a great resource for learning more about the labels inside vintage clothing. There are 16 pages worth of photos of labels and brief histories of companies that produced them. 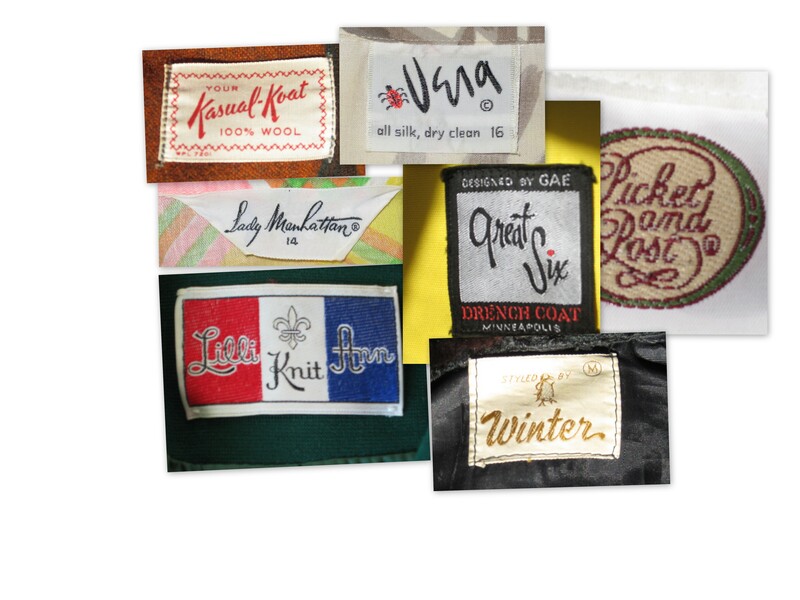 It can be a useful resource in dating an item of clothing, using the photos of designer labels from different decades. I looked through each page of the VFG’s guide, perusing the histories of the designers and companies. I noticed a general pattern. For labels like Edward Abbott, B. Altman and Co, and Bonwit Teller that are no longer on the market, it seemed as if they closed or were purchased by larger companies in the 1970s or 1980s. The 1970s and 1980s were a period of intense change in the American textile and fashion industry. Through most of the 20th century, clothing “Made in the USA” was common. The United States had textile mills, knitting mills, and many small clothing companies who hoped for a hit from a “hot little number” each fashion season. 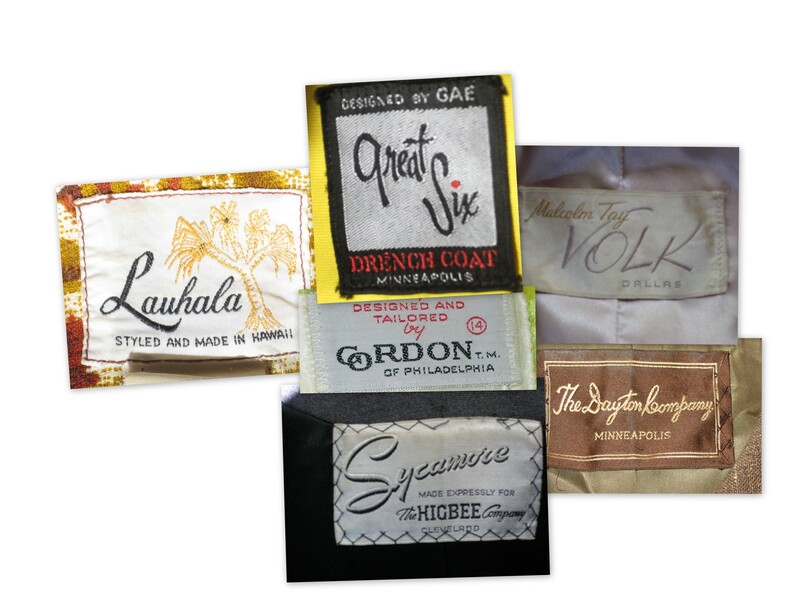 The variety of labels and their regionalism in my closet reflects the structure of the pre-1970s clothing industry. But in the 1970s, U.S. clothing makers increasingly encountered competition from foreign imports from places like Hong Kong. U.S. clothing manufacturers began to close textile mills, laying off workers and seeking cheaper labor and lower production costs overseas. The well-known “Look for the Union Label” television ad campaign was launched in 1975 by the International Ladies Garment Workers’ Union to stem the tide of loss. In this 1978 version of the ad, the explicit plea to Americans to not buy imports is plain. As I look through my contemporary clothes, I see label variety, but sometimes each label only represents a particular clothing line or limited style run from a larger company. Merona, Converse OneStar, Liberty of London for Target. Banana Republic, The Gap, Old Navy. And the fact that all are imports shows how the ILGWU’s Look for the Union Label Campaign didn’t convince enough American consumers to buy American. As with the vintage clothing, the newer labels represent the way the larger clothing industry is now organized, with a smaller number of large, conglomerated companies who produce clothing on a “fast fashion” cycle using mostly Chinese labor. There are also alternatives to this mass-produced, “fast-fashion” model that characterizes most of the industry today. We are witnessing increasing interest in “buying local” “fair trade” and making more eco-friendly clothing decisions (such as buying secondhand, clothing made from recycled products, or buying US made clothing that has traveled fewer miles as part of its carbon footprint). The website Ecouterre produces a daily newsletter on the latest in clothing that is made in the USA, fair-trade fashion, and eco-friendly textiles. And the show Project Runway has helped call attention to the efforts of local designers by featuring a new cohort each season. In terms of Made in the USA, I have been captivated by the story of Seema Sudan, the American designer of LiaMolly knitwear whose story I learned about on Kickstarter. When a Chinese manufacturer ended her contract producing sweaters she designed because her orders were too small, she decided to produce her creations at home. Her Kickstarter fundraising brought a new high-tech digital knitting machine to New Orleans and she is about to begin making sweaters again. Such changes are welcome, giving us more labels to love. In one sense in North America today, one could say fashion is suburban, not urban. According to the 2010 census, most cities in the U.S. have continued to lose population to their surrounding rings of suburbs, where most Americans now live. What this means in terms of fashion is that, from a retail standpoint, most clothing is purchased in suburban malls, not city boutiques, department stores, or vintage shops. And yet, to think of suburban fashion seems oxymoronic. Critic James Howard Kunstler refers to the suburban landscape with its ubiquitous chain stores as a “geography of nowhere.” There is some truth in the observation that many suburban spaces lack specificity — a sense of being in a particular place with a particular history that can be recognized from its built environment. It is no wonder that fashion designers, editors and marketers often refer to the apparel they hawk as having an “urban look,” an “urban edge,” or an “urban feel.” It is the city with its storefronts and plate glass windows, its sidewalks, plazas, bars, coffee shops, nightclubs and theaters that is the setting where fashion blooms and becomes a feast for the eyes. Georg Simmel observed that there is an inherent paradox of fashion; to be fashionable, one must both stand out and fit in. And the city is the setting where the success of one’s efforts are judged. With a large audience of strangers whose gaze one can attempt to attract or avoid, urban dwellers must decide where to locate themselves on the continuum of standing out and fitting in. Many people dress to be looked at in the city – at least to attract a glance or a brief acknowledgement. With the exception of teenagers, the suburban shopping mall is not a place where shoppers “dress to impress” those who walk its broad corridors. There is something about the city street that communicates the social significance of public space which makes strolling down a fashion avenue an engaging visual experience, whether one looks at the store windows or at the reflections of others looking. In fact, fashion, in terms of how it is displayed for visual consumption in store windows on city streets, has the ability to define an urban area perhaps like no other commercial good. The display of clothing can determine whether there is active street life in particular parts of the city. It seems that only fashion retail can draw people to slowly walk up and down a particular avenue, looking at the window displays and at one another, even after stores have closed for the evening. William Whyte, in the Street Life Project in which he studied the public plazas of New York, observed that the number one activity there was “People watching people…watching people.” Fashion has always been dependent upon cities for providing spaces where there is a potential audience to gaze upon those who walk its sidewalks. Elizabeth Wilson in Adorned in Dreams describes how eighteenth century Paris was a city where fashionable aristocrats promenaded in their finery through its parks and boulevards. As Thorstein Veblen observed, displays of class difference was the point of fashion for most of its history, though the 20th century eventually witnessed more diverse displays of street style. Veblen, were he alive today, would have difficulty recognizing class difference through dress. Valerie Steele contends that this blurring of class boundaries through fashion represents a “democratization of fashion.” The types of clothing purchased by elites is no longer noticeably different from that bought by the middle-class. But the spaces where different types of fashion is sold is not democratic. These spaces are marked in ways that remain deeply inscribed by class. 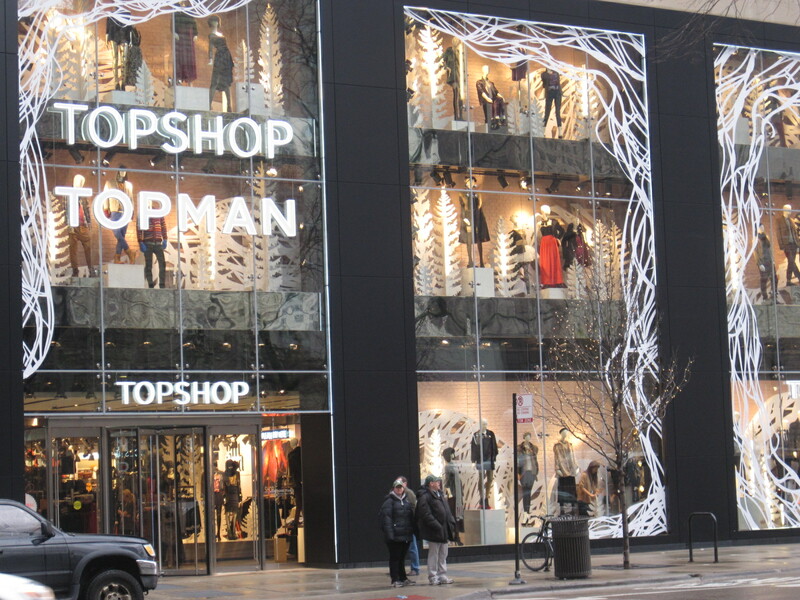 There is a reason why, in Chicago, elite brands like Burberry, Escada and Ferragamo seek storefronts on Michigan Avenue and not the suburban shopping mall. Such downtowns of major cities remain the centers of finance, and therefore they are most likely to have the elite “one percent” of the population who can afford their apparel. 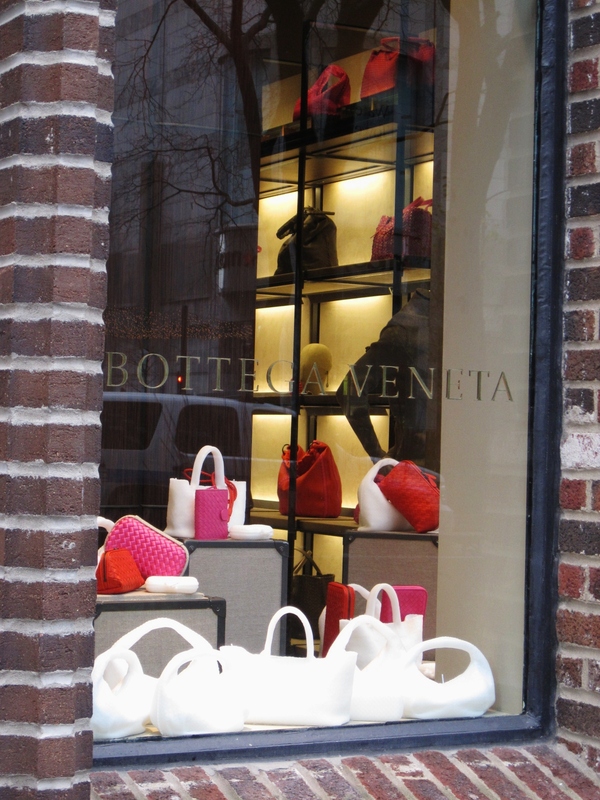 Crowds stroll up and down these fashion avenues to look in the windows of the elite boutiques, but affluent stores’ use of subtle codes signal middle-class customers not to venture further than window-shopping. And thus Louis Vuitton, Bottega Veneta, and Armani are relatively quiet, their clerks patiently waiting for a wealthy customer to pay $2,000 for fine Italian wool slacks, while there are lines at the cash registers of the Michigan Avenue H & M, Banana Republic and the Gap. These same stores could be found at the mall, but in the built environment of downtown, the stores for the wealthy seem equal to the mass-market retailers, thus adding to their allure in this particular urban space. When looking at fashion magazines it is easy to forget that designer fashion is only one part of “Fashion.” There are multiple fashion scenes in metropolitan areas, with smaller scenes occupying the commercial main streets of neighborhoods that cater to the specific communities who live nearby. Here, the store windows may display clothes that appeal primarily to working-class African Americans. And, there are immigrant neighborhoods whose windows are filled with brightly-colored head scarves and the ankle-length skirts of the East African immigrants. There are also alternative fashion scenes for those who want to bypass mainstream homogeneity and find the unique or quirky. These scenes are marked as “edgy” by the way the urban spaces are coded by graffiti, a bit of grittiness, and post-industrial decay. Clusters of vintage and secondhand clothing stores, and indie boutiques often appear in these areas. If the stores in the downtown fashion avenues suggest affluence and elegance, the atmosphere of these fashion scenes suggest irony. 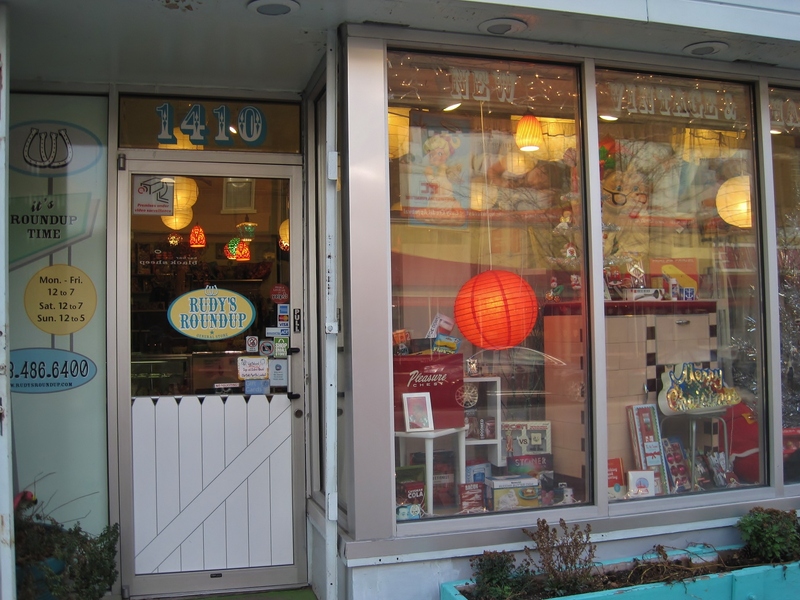 Such stores are playful, with a somewhat disheveled layout; shelves of old toys, mid-century housewares and oddball art interspersed with the clothing. Playing the role of urban ethnographer, I observe hipster couples who make a Saturday of visiting the secondhand shops in Northeast Minneapolis, first joking with one another about buying the outrageous kitsch items that first attract their eyes. After the joking back and forth of “you should get this [red, white and blue sequined short shorts],” they become serious, intently foraging through racks and bins for the perfect ironic t-shirt or disco dress for an upcoming 80s party. What the secondhand and vintage shops add to the urbane fashion scene is a sense of spontaneity, discovery and surprise. Chain stores like Urban Outfitters, American Apparel or Brooklyn Industries try to capture some of the vintage/secondhand stores’ ambiance by locating themselves within the same neighborhoods and having a similar set-up, with small toys, kitschy apartment-wares, and clothing. If shoppers do not find the perfect fit in the vintage store, success is more likely to be found in these chains that at least have a retro look about them. According to Nicky Crewe and Louise Gregson in Secondhand Cultures, the resale shops and vintage clothing stores in the “edgy” parts of town are eventually threatened by the very sartorial popularity they help create for these urban areas. Chain stores encroach, nearby buildings are rehabbed into condos, the rents rise, and eventually the resale shops with their smaller profit margins try to find other “up-and-coming” parts of the city that attract hipster youth who are also likely to move on, away from the gentrification, thus maintaining a cycle of fashion defining and redefining the scenes of the city. As the world economic recession continues and Western cities become more economically polarized, the question arises of whether all of these multiple metropolitan fashion scenes – suburban malls, elite flagships, small ethnic boutiques and vintage shops – can all remain part of the urban shopping ecology. Welcome to The Social Life of Secondhand Clothes! I am a sociologist and an urban studies researcher from Minneapolis-St. Paul who is endlessly interested in secondhand clothing – particiularly vintage – and the people who wear it. I will be blogging about secondhand and vintage clothing, the urban spaces where it is bought and sold, and what it means to those of us who wear it. Stay tuned….